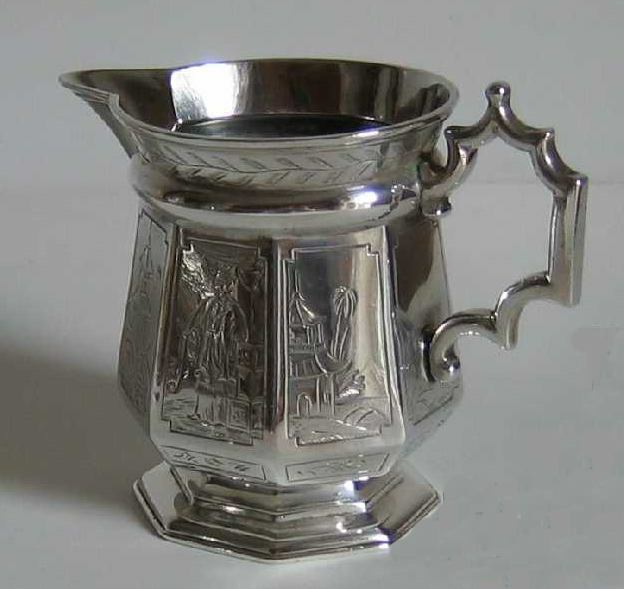 This creamer was manufactured in London by John e George Angell, belonging to an important silversmith family. 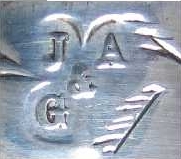 Queen Victoria head (duty mark). The creamer has octagonal shape, a seven scrolls handle of oriental inspiration and is fully engraved with 'chinoiseries' decorations (uncommon in this period). This style of decoration was in fashion in the Netherlands and in England in the last quarter of the 17th century, following the import of oriental pottery and porcelains and the publication of Far East traveller's reports . After its original fashion in the 17th century (mainly on tea related hollowware, like tea caddies) , a revival occurred in the 19th century (circa 1870) in connection with the diffusion of the Aesthetic Movement. 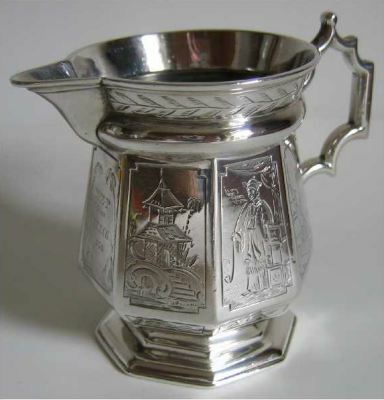 Five faces of the creamer are engraved with palms, pagodas, floral motifs and oriental figures in their everyday life; one face is engraved with floral motifs only and one with a brief inscription (MEP da MEECG, 1870), denoting that the creamer was used for a gift 22 years after its manufacturing. The creamer is fully hand made using the 'sewing technique', with the body (obtained by working a flat sheet of silver) soldered to the base.